sailboat. : September 2013 non-beauty favourites! I always feel that September is a bit of a transitory month; summer is over but autumn hasn't completely arrived and I never feel like I quite manage to finish everything I set out to achieve because before I know it, the month is over. Nevertheless it ended up being a good one, one full of rediscovering my love of literature and accessories - there can't be anything bad about that. Since discovering GoodReads I have fallen back in love with literature and I read quite a few books during September but these three were the stand-outs by a long way. Coco's Secret* by Niamh Greene is a beautiful book that follows Coco as she discovers an old letter hidden inside a vintage Chanel handbag she finds in a box of bric-a-brac bought at auction and her journey as she pieces together the clues that will hopefully lead her to the letters' rightful owner. I popped up a slightly more detailed review here but it's no secret that I loved it. There's one particular part where I got a little teary-eyed and I think that's a real testament to Niamh Greene's writing. She even took the time to tweet me saying that she liked my review, which I thought was incredibly lovely and thoughtful. I will definitely be reading another of her books very soon. The Casual Vacancy by J.K. Rowling is a book I was a little apprehensive about reading, but I needn't have been because I absolutely adored it. The town of Pagford is seemingly idyllic, but all is not as it first appears to be and the death of a parish Councillor becomes the catalyst for the biggest 'war' the town has ever seen. I go much more into detail about why in my post here, but I think Rowling manages to create such a wonderfully complete world as well as characters I became really invested in and cared about. Not for everyone, but I loved it. The Cuckoo's Calling by Robert Galbraith is J.K. Rowling writing under a pseudonym and I think it's a thoroughly cracking crime novel. When troubled model Lula falls to her death from a snow-covered Mayfair balcony, it is assumed she has committed suicide but her older brother has his doubts and calls in private investigator Cormoran Strike to take a close look into the case. I'll have a full review up very soon, so all I'll say here is that if you've been thinking about reading it, definitely give it a go! 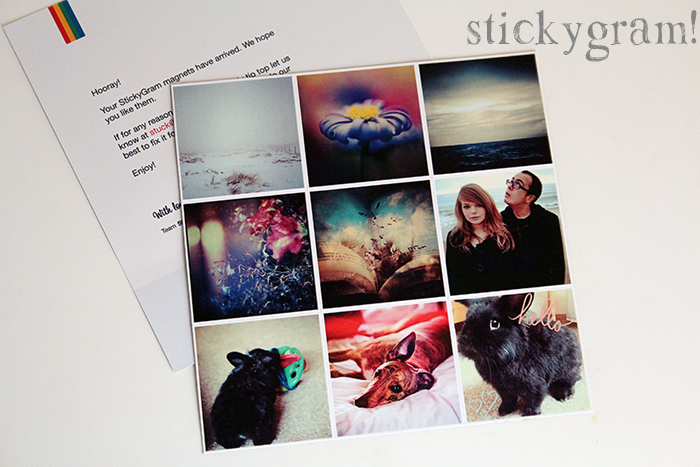 Stickygram (who are awesome) got in touch, I had the opportunity to get a few of my instagram pictures printed on to sweet little magnets and I think they're pretty fabulous. I'm so pleased with the quality and the vibrancy of the prints and they popped through my letterbox at lightning speed - it's almost as if they magicked them over! I'm working on a cute way to display them at the moment, I think they're too pretty to be hidden away in the kitchen where we don't spend too much time - I want to be able to look at them all the time instead! 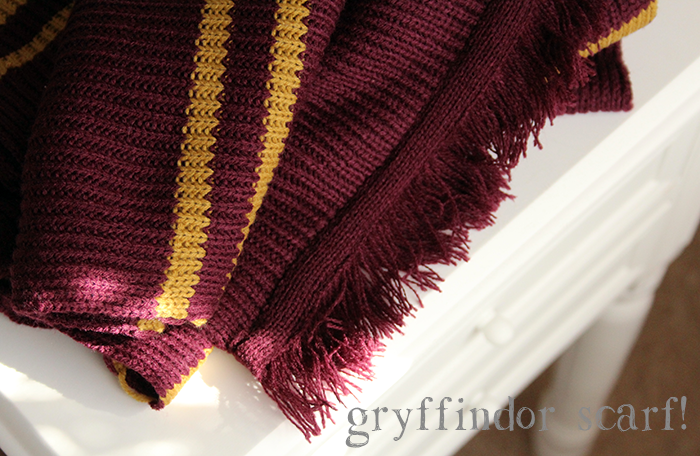 My Gryffindor scarf that I got in the gift shop at the Harry Potter Studio Tour had to feature in here somewhere, even if I have only been able to wear it twice so far. Hurry up cold weather! I really want a Ravenclaw scarf too so I've bought myself some knitting needles and I'm going to attempt to learn how to knit. I've heard it's pretty relaxing when you get into it and I think it'll be nice to force myself to have a little bit of down-time because things are going to be pretty hectic over here for a while. I'm hoping I'll have the patience (and ability) to at least start and finish knitting one scarf. Who knows, it might even end up being something I really love! My last favourites are necklaces and it's been really nice to wear them again after quite a long time of wearing, well, not very much jewellery at all. I bought a Time Turner necklace from eBay after wanting to buy one at the Studio Tour but not spotting any and I just love it. I'm not sure how much I'll actually end up wearing it because it's pretty big, but it's ridiculously pretty and I have it out on display so it's lovely to look at! The blue Fishing Boat necklace* was gifted to me by Koa Jewellery, a Cornish, ethical handmade jewellery company making pieces inspired by the ocean. The deep blue shade is simply stunning and I've received so many compliments when I've worn this, it has fast become one of my most favourite pieces. The silver sailboat was a gift from Mark when he returned from his mini-holiday to Cornwall and I think it's so perfect & thoughtful that I've barely taken it off since I opened it. It's so detailed, truly a piece that is small but perfectly formed. And finally mine and Mark's initials from an etsy seller called Rose and Raven, which is a ridiculously sentimental piece of jewellery that will be a favourite for a long time to come I think. What has been your favourite book you've read recently? I absolutely LOVE the time turner necklace.... it's absolutely gorgeous!!! I can just about knit, but I can only do the basic stitches, I wish I had more time to sit and learn more, though. I love the boat necklace, so pretty and perfect for you. The time turner necklace is so gorgeous! There's a few similar ones I'm eyeing up on etsy at the moment. I can knit, just not exceptionally well. I've actually got a scarf begun from a year or two ago... maybe I should dig it out and give it another go! Nice!! I want to read that book from J.K. rowling so bad. I love stickygram! I need to order some more sometime soon. I am really interested in J.K Rowlings crime novel will have to check it out. I will have one of everything please!!!!! Aw the little sailboat necklace is so sweet! Those necklaces are lovely! So delicate, it's a refreshing change from all the big chunky pieces around. 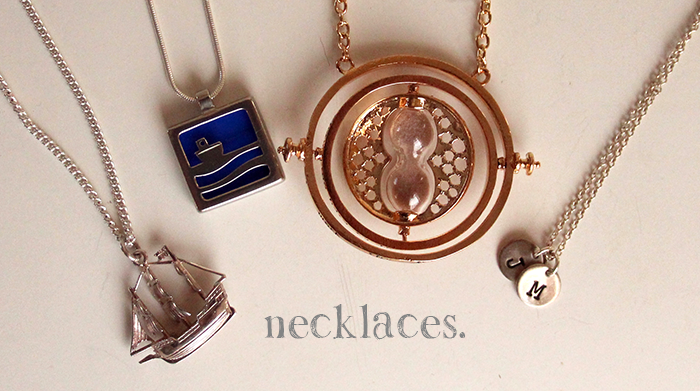 You'll need the time turner one to be able to wear all those necklaces! :) I LOVE that silver sailboat necklace. Does Mark remember where he bought it? If it was just some independent shop, does he remember what town? Your photography is always so beautiful! I love the magnets, too, what a lovely idea! Enjoy reading your posts. 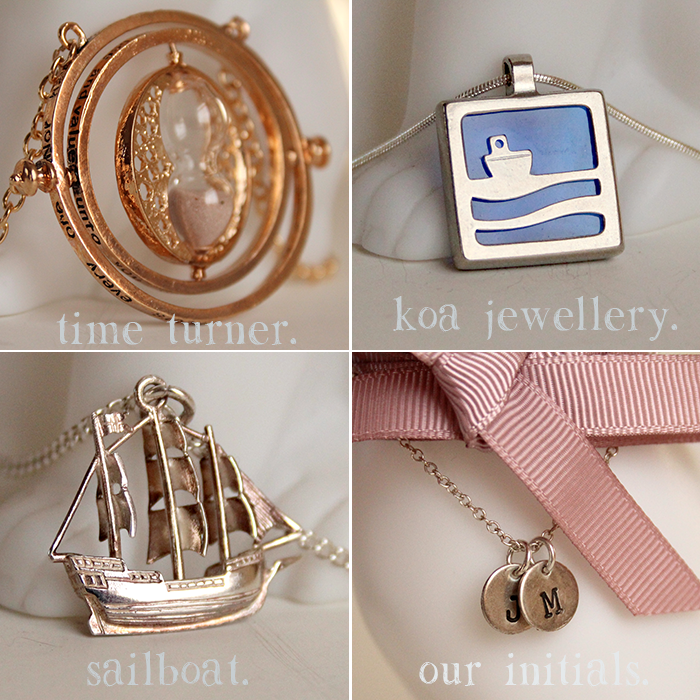 Love the boat necklace, so detailed, love pretty necklaces. I knit a fair bit, once u get going you'll love it. There's loads of tutorials and videos out there to help you. And lastly- my fav book recently was 'A fault in my stars', brilliant book, so well written and made me cry A LOT!!! Yeah, def read it, I'm gunna get hold of another book of his to get reading as loved it sooo much! love your books recommendation ! 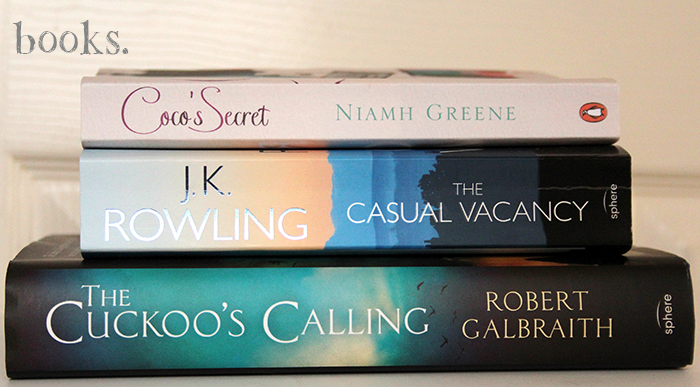 :) will pick the casual vacancy soon . I have to read The Cuckoo's Calling! I'm a huge fan of mysteries so I have a feeling I'll love it :) And I absolutely adore that necklace with the initials... such a good idea! My first thought today after reading this post "No way oh my god you got a time turner aaah!" I loved going to Harry Potter Studio Tours it was a truly magical day, I picked up the exact same scarf but in Hufflepuff colours and a cheeky deathly hallows keyring...and sweets.I know I'll be secretly wearing it this autumn! I always love your monthly favourite posts they always inspire me to read more and try new things! 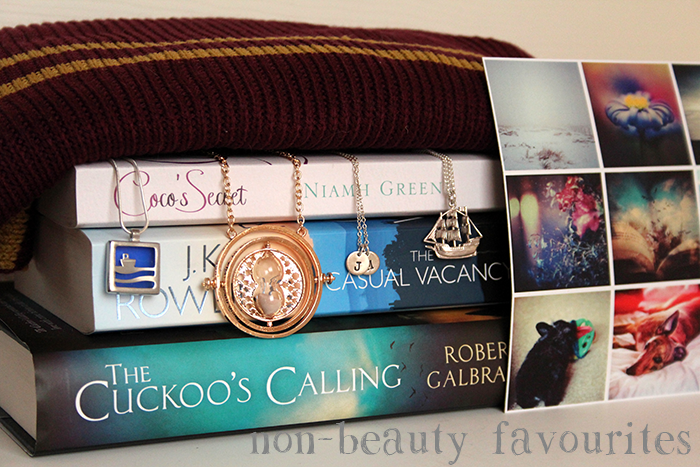 I absolutely love that time turner necklace, adorable!